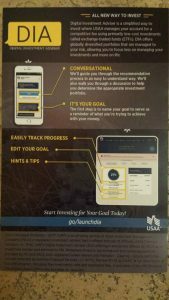 USAA put on a great show at their Digital Military Experience Conference in San Antonio at the end of October 2016. For a run down on some of the speakers and topics discussed, see this post. On the final afternoon after the closing remarks, dozens of USAA employees gathered to show off what they had been working on behind the scenes at USAA. Many of the things the various departments demonstrated were pie-in-the-sky ideas that probably won't see the light of day. Despite that, it was fascinating to see some of the ideas that USAA is working on. The bank's mobile app, customer service experience, and low (or no) fee financial products and services are extremely useful to me day to day and long term. I have been a happy customer since 2008 and every year it seems they come up with new and innovative products that make my life easier at no additional cost to me as a customer. I have not set foot in a bank in 8 years and don't plan on ever doing it again. This was the most interesting idea I saw presented in the exhibition hall. 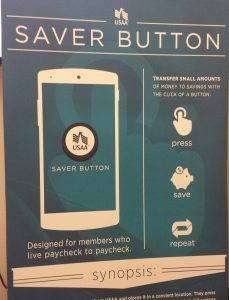 It's a small button, emblazoned with the USAA logo, similar to an Amazon Dash button, that syncs via Bluetooth to your phone. 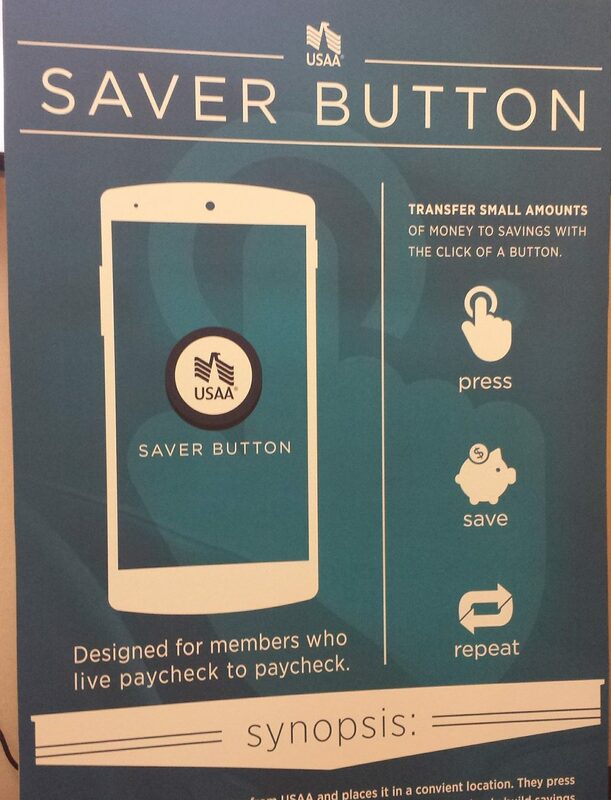 When you press the button, it transfers $1 from your checking account to your savings account. Press the button again, and it moves $2. 3rd time: $3. 4th: $4. Maximum of four presses per day for a total of $10. Talking to the developers behind the idea, it was interesting to hear them discuss the behavioral economics aspects of a physical action tied to a digital transfer. Since most of our bills, transactions, payments, and income is digital, it's hard for some people to connect their digital dollars to real money. By having a physical action (pressing a button), you create an immediate haptic feedback and reward. While the project is still in beta, there were interesting ideas like setting a different amount that get's saved every time you push the button. Image if instead of $10/day it was $100/day max savings. Even $10/day in savings is $300/month, or enough for a solid emergency fund after a year. The team that designed the button also discussed tying the button to a choice you made in your home. While you know you'll save a few dollars by making coffee at home versus going to Starbucks, that money usually doesn't actually get saved. It just gets spent on something else. By having a savings button above your coffee machine, you could give yourself a click when you make your coffee in the morning or when you bring your lunch to work. The military friendly bank continues to serve it's military members by providing educational material related to the new military retirement system or Blended Retirement System (BRS). They have a much cleaner and easier to understand website than the government set up available at USAA.com/brs. They are developing a calculator to help with the decision making process, which should help servicemembers who are eligible to switch. My advice remains the same: if you are eligible and you are not committed to serving 20 years, you will do yourself a favor by switching to the new system. 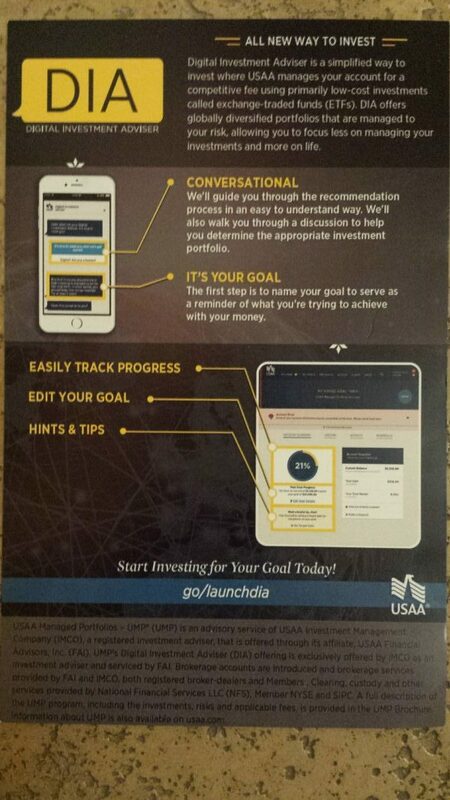 This is USAA's answer to the robo-advisers like Betterment: the USAA Digital Investor Advisor (DIA). It's hard to find anything else about this service online at the moment as they have launched it either in private beta or very quietly. From my discussion with the USAA developer who was promoting the product, it sounded like they use an industry standard risk assessment quiz and then put you into a variety of ETFs based on your investment profile. From what I can recall the fee was 0.50% or 50 basis points for the service, which makes it cheaper than Personal Capital (which starts around 1%) but more expensive than Betterment (0.35% for accounts less than $10,000) or Vanguard (0.30%). I probably will not be using their service, but if you want to consolidate all of your financial accounts in one place it might be worth looking at. The fee is lower than industry average, but still more expensive than some very good alternatives. Remember: higher fees do not produce better returns. In general, the opposite is true as the fund must perform much better than it's cheap, indexed, passive benchmark to compensate for the additional costs. Those are some of the interesting things USAA works on behind the scenes. I also saw a USAA debit card that offers a cash back solution, but the account does not have free ATM usage, so that would be a show stopper for me. 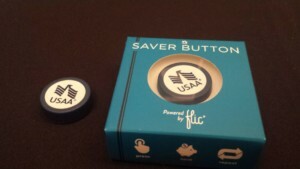 USAA is also expanding their “USAA Labs” program, which solicits ideas from both employees and members. Currently they are testing a text based savings program, similar to Digit. The system automatically transfers small amounts from your checking account to your savings account, based on your spending patterns. It's in beta now if you would like to sign up to help USAA test it. As a happy USAA customer for 8 years, I am glad to see that USAA continues to take in employee and member feedback and ideas. When you are an online only bank, serving military customers scattered around the globe, it is imperative that you stay ahead of the technology game and you continue to provide world class, military friendly service. I plan to remain with USAA for life and recommend them to every family member and servicemember I meet.